WHILE ON HOLIDAY TOGETHER IN SPAIN, former tearaway Mitch Rapp (an extraordinary portrayal by Dylan O'Brien) proposes on the beach to his girlfriend Katrina Harper (Charlotte Vega in an all too brief appearance). A devastated Mitch survives and gradually recovers from his physical injuries, but he is left emotionally disturbed with an understandably obsessively bitter lust for revenge. Eighteen months later, in Providence, Rhode Island, he hatches a plan and begins to get himself into shape, learning how to shoot and how to fight. Spending hours on the Internet checking Islamic history, he allows himself to be recruited into the terrorist cell he is convinced is responsible for Katrina's death; but during a meeting in Tripoli, Libya, he discovers he is being tracked by the CIA who raid the building and kill the extremists. Impressed with his steadfastness but aware of his naïveté in thinking he would get away with his ruse, Irene Kennedy (Sanaa Lathan), the Director in charge of Counter Terrorism, wants Mitch to join her division of the CIA, a decision reluctantly shared by fellow Director Tom Stansfield (David Suchet). Following a gruelling selection process at Roanoke Valley, Virginia, during which Mitch proves his determination and resilience under the extreme pressure and daunting trials of ice-cold, iron-willed former US Navy SEAL Stan Hurley (Michael Keaton), Mitch is ready for action. And action it is all the way. The theft of Russian plutonium leads to the realisation that someone is planning to build a nuclear bomb and the most likely culprits are the Iranians. Irene and Tom visit the Iranian Embassy in London and speak with Minister Behruz (Navid Negahban) and General Rostami (Joseph Long), whom Tom instantly distrusts and who strenuously denies having anything to do with the plutonium. But if it is not the Iranians who are planning a nuclear strike then who is, and why and where? Having investigated a wave of apparently random attacks on military and civilian targets, the CIA has recognised a pattern to the violence. As the mission crosses boundaries of loyalties and trust with the odd red herring, Tom and his team have to think quickly on their feet as they enter a frantic race to prevent the mysterious operator from pressing the detonator to set off the Third World War. Based on the best-selling Vince Flynn (1966-2013) series of novels of the same name and by it's nature sometimes exploding into violence, American Assassin is a fast-moving, energetic and hugely gripping thriller with the relentless Dylan O'Brien heading a remarkable cast of believable characters. 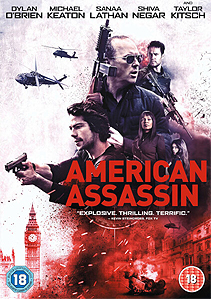 American Assassin also features: Shiva Negar as Annika; Taylor Kitsch as Ghost; Scott Adkins as Victor; Alaa Safi as Javeed; Khalid Laith as Sharif; Mohammad Bakri as Ashani; and Shahid Ahmed as Adnan Al-Mansur; and Sharif Dorani as Iranian Nuclear Physicist. Stunt Co-ordinator Buster Reeves also appears as The Martial Arts Instructor. Music is by Steven Price; Director of Photography is Enrique Chediak, ASC; Screenplay by Stephen Schiff, Michael Finch, Edward Zwick and Marshall Herskovitz; Produced by Lorenzo di Bonaventura, pga, and Nick Wechsler, pga; and Directed by Michael Cuesta. * Packed with epic action scenes that will set your heart thumping, the brutal espionage thriller American Assassin is released on DVD, Blu-ray, 4K UHD and VOD by Lionsgate in the UK on 15 January 2018 (the movie will also be available to download on 8 January 2018). Certificate: 18 | Running Time: 111 Minutes. BD/UHD Features  Target Acquired: Creating an American Assassin | Finding Mitch Rapp: Dylan O'Brien | Transfer of Power: Hurley & Ghost | Weaponized: Training & Stunts | In The Field: Locations | Alamo Drafthouse Q&A.